Microsoft's Internet Explorer 10 final is currently only available for the company's latest operating system Windows 8. It is available as a preview version for Windows 7 as well, the only other operating system by the company that it will be released for. While Microsoft has not revealed any information about the final release date of IE10 for Windows 7, it is very likely that it will be released in the near future. What we do know is that Internet Explorer 10 will be delivered to users of Windows 7 Service Pack 1 and Windows Server 2008 R2 Service Pack 1 as an important update via the operating system's automatic update feature. What this means, basically, is that it will be installed on most Windows 7 and Windows Server 2008 R2 systems automatically without user interaction. The Toolkit to disable automatic delivery of Internet Explorer 10 has been created by Microsoft to give individuals and businesses the means to block IE10 from being automatically installed on computer systems it is installed on. 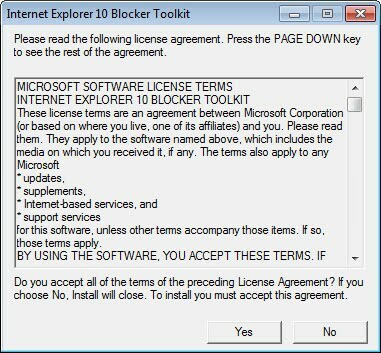 The Blocker Toolkit prevents the installation of Internet Explorer 10 via Windows Update and Microsoft Updates sites, but not the manual installation of the web browser, for instance by downloading it from Microsoft's Download Center or external media. Microsoft notes that it is necessary to run the program on systems where IE8 or IE9 Blocker Toolkits are already deployed on to prevent the installation of Internet Explorer 10, as different Registry keys are used to block those installations. Simply run the program after you have downloaded it from Microsoft's download site. You will be presented with the end user agreement first which you need to accept to continue. You are then asked to pick a location to extract files to. Once done, open an elevated command prompt with a click on Start, typing cmd, right-clicking cmd.exe and selecting run as administrator from the context menu. Run the command ie10_blocker.cmd /B and hit enter to set the blocker on the machine. This creates the new Registry key value DoNotAllowIE10 and sets its value to 1 under HKLM\SOFTWARE\Microsoft\Internet Explorer\Setup\10.0. To deploy Internet Explorer 10 at a later time on a system it has been initially blocked on, delete the key. Additional information about the process can be found on Technet. A question: I have set ‘check for updates but let me choose whether to download and install them’. (Control Panel > Windows Update > Change Settings). Will this still be installed without me knowing about it ? If you have set the update system to notify you, that is what is going to happen. Hello, will my IE9 be upgraded to IE10 if I have internet explorer disabled in Windows Features? I do want to upgrade it to IE10 even if it is disabled. Good question that I can’t really give an answer for. My guess would be that you won’t receive the update since it is disabled. Martin, Thanks for the update. I still have one – ore two questions concerning the update. I have a 32 -bit and 64 bit version of MS-IE9 on main win7 64 bits version installed. Does the update to MS-IE10 automatically sees that I have two version’s? do i get delivered, by the update, a 32 bit or 64 bits version? And how can I install separately the missing version? Unless you have a 32-bit CPU or a 32-bit only version of Windows 7, it will only give you the 64-bit version. There’s no longer two versions of IE when it comes to IE10. If you have 64-bit Windows 8, you have 64-bit IE10. I assume it’s the same way with the Windows 7 upgrade. Thanks for a valuable piece of information. You could also just skip the toolkit and push out the registry key by other means, e.g., login script, group policy, etc. As Kent mentioned, since this is just a registry key change, you could deploy it one of a lot of different ways.